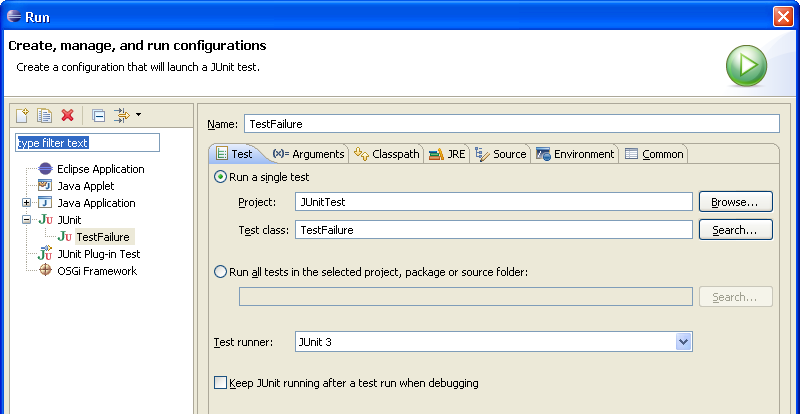 In this section, you will be using the JUnit testing framework to write and run tests. To get started with JUnit you can refer to the JUnit Cookbook. Open the New wizard (File > New > JUnit Test Case). Note: If you want to use JUnit 4 tests you have to make sure that your compiler compliance is set to 1.5. You will see a warning message asking you to add the junit library to the build path. Use the Click here link to add the junit library automatically. Click Finish to create the test class. Add a test method that fails to the class TestFailure. A quick way to enter a test method is with the test template. To do so, place the cursor inside the class declaration. Type "test" followed by Ctrl+Space to activate code assist and select the "test" template. Change the name of the created method to testFailure and invoke the fail() method. Now you are ready to run your first test. The view is shown in the current perspective whenever you start a test run. A convenient arrangement for the JUnit view is to dock it as a fast view. The JUnit view has two tabs: one shows you a list of failures and the other shows you the full test suite as a tree. You can navigate from a failure to the corresponding source by double clicking the corresponding line in the failure trace. Dock the JUnit view as a fast view, remove the fail() statement in the method testFailure() so that the test passes and rerun the test again. You can rerun a test either by clicking the Rerun button in the view's tool bar or you can re-run the program that was last launched by activating the Run drop down. This time the test should succeed. Because the test was successful, the JUnit view doesn't pop up, but the success indicator shows on the JUnit view icon and the status line shows the test result. As a reminder to rerun your tests the view icon is decorated by a "*" whenever you change the workspace contents after the run. - A successful test run, but the workspace contents have changed since the last test run. 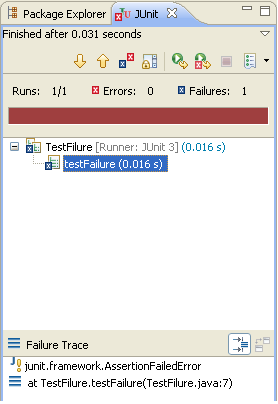 Double click the failure entry from the Failures tab in the JUnit view to open the corresponding file in the editor. 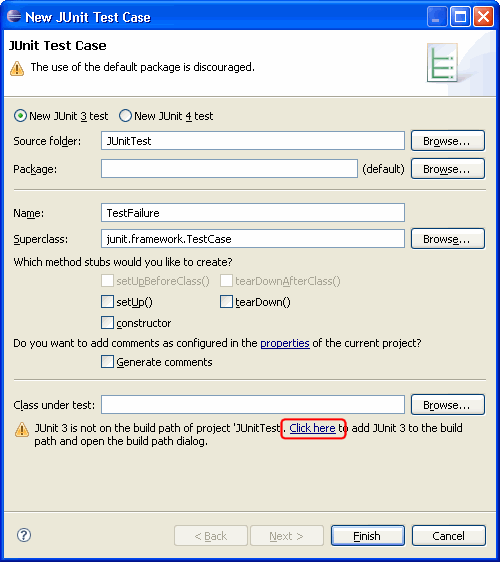 Select the test case and execute Debug As>JUnit Test from the Debug drop down. 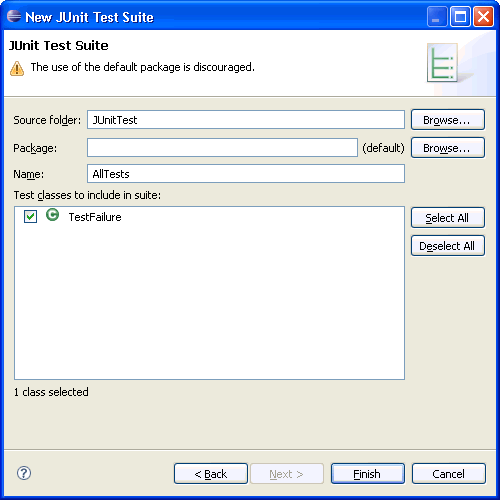 The JUnit TestSuite wizard helps you with the creation of a test suite. You can select the set of classes that should belong to a suite. Enter a name for your test suite class (the convention is to use "AllTests" which appears by default). By re-running the wizard and selecting the new set of test classes.